Warriston Cemetery, just over a mile to the north of Princes Street, covers a large area beside Warriston Crematorium. The upper part of the cemetery has gravestones laid out in neat rows. The lower part has become rather overgrown (but is perhaps now looking better following the recent establishment of the 'Friends Of Warriston Cemetery'. - some of the these had unfortunately been broken when they were toppled 'Health and Safety' reasons. - others had become overgrown. 1. "Is the building shown in the background of this engraving the shrine known as the tomb of the RED LADY as it was when I was a child?" 2. "I believe the reason for such a fine tomb was that MARY ANN ROBERTSON was murdered by her master who was tried and hanged in Edinburgh. Was that correct?" "A Victorian Gothic structure made of iron and glazed with coloured panels; ruby glass roof & green glass walls. Between the roof & the walls there was a frieze effect created with lighter, rectangular glass panels - perhaps milk glass - on which there was an inscription. written in ornate Gothic script and travelling all the way round the structure was The Lords Prayer." I don't know whether or not she was murdered by her master who was then hanged. Perhaps somebody else will provide answers to these questions. - Peter Stubbs: January 17 2006. "Regarding Mary Ann Robertson, and whether she was murdered - well it looks as though she wasn't. I was going through some newspaper cuttings the other night and came across an Evening News article dated 3rd August 2006 to publicise "The Edinburgh Graveyard Guide" by TRB Turnbull. It doesn't say how Mary Ann Robertson died; maybe she contracted her husband's illness, maybe not. "I've heard stories of the tomb being desecrated sometime in the late 1970's or early 1980's. I was wondering if you could shed any light on the story that her skull was removed by someone high on drink and drugs and that they were subsequently jailed for the offence." Alan Wilson, Trinity, Edinburgh: October 4, 2007. "Vandals have destroyed what was once one of Edinburgh's most impressive burial places - an arcaded Gothic shrine of white marble, and roof of ruby-coloured glass, which formed the last resting place of Mary Ann Robertson (d.1858). Today, all that is left of the chamber, once carved with lilies, palms and oriental patterned glass, are its broken foundations and the smashed marble figure that used to lie inside. The tomb was erected in her honour as the Manson, of the Bombay Artillery. She had married Captain Alexander Robertson, the 8th King's Regiment. When he became ill with fever at the siege of Delhi in 1857, he was sent home to be nursed by his wife. Sadly within a few months it was Mary Ann who was dead." "I checked the microfiche of the Evening News in the Central Library. It's a slow process, but I found a report dated 26 June 1979 where 5 youths aged between 15 and 20 where charged with breaking into the crypt (very close to Robertson monument) on 11th September 1978, smashing marble slabs securing a coffin, breaking it open and scattering the remains and carrying away a skull. So it looks as though the story I heard was almost correct." - Click on 'Images on-line' and you will see thumbnails of the photographs. - Click on a thumbnail and a larger image with all the collection details will appear. - Click on the image again and the largest version will be shown." "My next task is to try and find where Warriston Cottage was. Hopefully the Arnott headstone is still standing and will give me a clue! Alan Wilson, Trinity, Edinburgh: December 12, 2007. "On the OS map dated 1896 for Inverleith & Canonmills and there's one building I think might be the cottage. It's next to the railway line / cycle path that cuts the cemetery in two. I know there are the remains of a building down at that part, so I'm hoping that the Arnott grave will be able to confirm it. Being a war grave I trust it's been well looked after by the Commonwealth War Graves Commission. If the weather's fine at the weekend I'll probably take a stroll down." Alan Wilson, Trinity, Edinburgh: December 13, 2007. "Well, I went along to Warriston Cemetery yesterday morning and discovered the cottage was where I suspected." The building can be found within Warriston Cemetery, immediately to the north of the old railway line on this 1915 map (lower centre of the map, above the first letter 'O' of the name 'BROUGHTON' printed in red on this map. "Only part of the right-hand gable still exists. The Arnott headstone pictured on the RCHMS web site confirmed I had the right the location." I lived in Logie Green Road. During the war years, we had a wee shop there. My friends were David Brown, the Heathcotes and George Reid"
"The Red Lady brought back memories. I worked as a grave digger in Warriston Cemetery in the early 1960s, after I came out of the Army. I also cut the grass, planted flowers etc. Mr. Pontin was Supt. then. The RED LADY was well looked after then." "I think I can shed some light on the question, near the top of this page, about the location of the tomb to the 'Red Lady'. 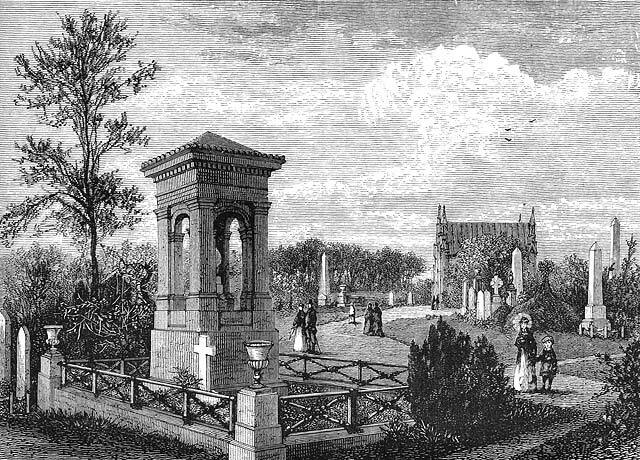 In the foreground of this engraving, you can see the monument to the Rev James Peddie. In the background, you can just make out a large obelisk. This is the tomb to Sir James Young Simpson. The tomb to the 'Red Lady' that the questioner asked about' is an old long-gone chapel that stood atop the catacombs. It is beyond the obelisk, to the NW end of the vaults. If you were to continue along the path in front of the chapel, as far as you can to the wall, the 'Red Lady' is on your left as you turn to go down the hill." "The roof of the tomb was indeed red glass. The rest of the building was white marble, apart from the Iron gate at the front. The Lord's Prayer was engraved around the bottom of the panels, ending with, 'And the trumpet shall sound three times and the dead shall be risen incorruptible'." "I was not aware of the murder story but that would make sense. I have sensed her presence on many an occasion there. I have even seen unexplained footprints in fresh snow around the shrine but not leading to or away from it, when no one else was there." I find it fascinating. The place has had its share of misfortune over the years with vandalism from thugs and officials alike, glue sniffers and drunks. It is a very valuable green space in the heart of the city. The fact it has become overgrown adds to the charm and serenity of the place. I hope it will remain so. Restoration to its former glory would be a fine thing yet it would in some sense be a great act of vandalism. I visited Warriston Cemetery a few months ago and took some photos of what I thought might be what is left of the tomb to the 'Red Lady'. Alan Wilson subsequently emailed me to confirm that this was her tomb. Thank you to Brian Malcolm for identifying some of the monuments in this old engraving of Warriston Cemetery. This is one of the engravings that appeared in Grant's 'Old & New Edinburgh' published in 1890. The memorial to Simpson, founder of the Simpson Memorial Hospital in Edinburgh and discoverer of anaesthetic. The chapel. At one time, the internment ceremony would have taken place here. There was speculation that the coffin was lowered into the vaults below the chapel, although I have not seen evidence of this from my time spent in the vaults. I've seen the destruction of the coffins and the bodies strewn about in there, along the front passage. I'd say that 1 in 4 graves are desecrated; it is very sad. Further back into the vaults, there is less destruction. I assume the darkness kept the vandals at bay. All that remains today of the structure is a raised mound centrally placed lengthways along the vaults. The skylights and ventilation shafts have all been filled in now, none to late, but I remember my mother who would now have been aged 86, telling me how the sunlight used to shine out thru the portcullis windows along the front of the vaults at certain times of the year. There are two substantial monuments to my family in Warriston, one still stands, sadly the other now lies flat face down." "I believe that the building Alan Wilson was talking about (in 'Recollectons 3' above) was the house where the Head Groundskeeper stayed with his wife and son . They were next to the greenhouse. "The vaults at Warriston Cemetery were about halfway down the hill. As far as I remember, there were about a dozen coffins interred in the wall, all sealed with their names on plaques except one in which you could see the coffin quite plainly. We were told that this was because the body had not been claimed. "Then, the cemetery was run by The Edinburgh Cemetery Co. They also ran Corstorphine Hill, Comely Bank and a few others around town. Warriston was one of the best maintained cemeteries in all Edinburgh. It's sad to hear of the mess it is in now." "There is some concern expressed on your website about the state of Warriston Cemetery - understandably! A friend and I are starting a 'Friends of Warriston Cemetery' group, with the aim of reclaiming the heritage from under all that ivy etc, managing the Urban Wildlife Site and striking a balance between biodiversity and all that irreplaceable history. The City of Edinburgh Council is very much in favour, and we have a lot of support. That sounds like good news! The Cemetery deserves to have a group looking after it, even though you'll not able to bring the Red Lady's Tomb and the vaults back to their original state - unless you get lottery funding! Perhaps that could be a long-term goal. Meanwhile, there should certainly be enough work to keep the group fully occupied! I look forward to seeing the progress that you make! 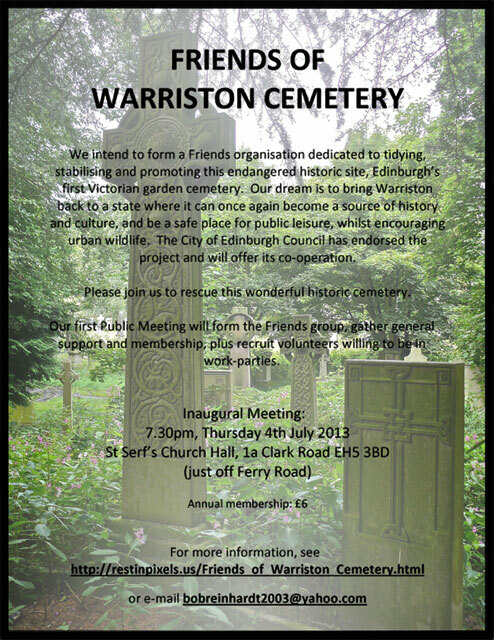 Thank you to Caroline Gerard for sending me, yesterday, a copy of the poster announcing the Inaugural Meeting of the 'Friends of Warriston Cemetery'. Unfortunately, the poster arrived a little to late for anybody who might have wished to attend that meeting. However, I have displayed it below so that people are aware that the group is now underway, and that they can see the web site address and email address to contact for further information. to let he know about this advertising flier from 1843, giving details of space for sale then in Warriston Cemetery, soon to be offered for sale on eBay. Caroline thanked me, then told me about the progress made so far by her Friends of Warriston Cemetery group. Since the group was founded in 2013, it has signed up more than a hundred members. "I'll try to remember to tell you when Warriston is looking particularly good, so that you can nip along to take more photographs. Early in the year there are snowdrops, then the daffodils we planted (and some others there already) come up, followed by the bluebells. In a few years' time we hope to have far less ivy (and invasive weeds) and far more 'pleasing' biodiversity. We want the place to be the family burial ground and heritage repository, with 'enhanced' biodiversity in between, that it could and should be. Well done on the progress to date. I certainly intend to return to the cemetery to take more photos this year. If your Friends of Warriston Cemetery group is ever looking for a long term project for the cemetery, how about seeking Lottery funding to recreate the Red Lady's Tomb that used to be a feature of the cemetery before being vandalized then removed? 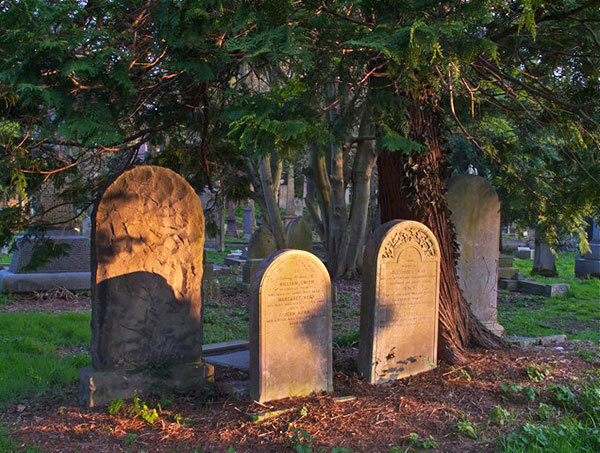 to say that he found it interesting, and also to let me see the photo below that he took recently, recently, capturing the evening light at Warriston Cemetery. Allan tells me that this photo got a lot of hits when he added it to the 'Graves and Cemeteries' group on Flicker.